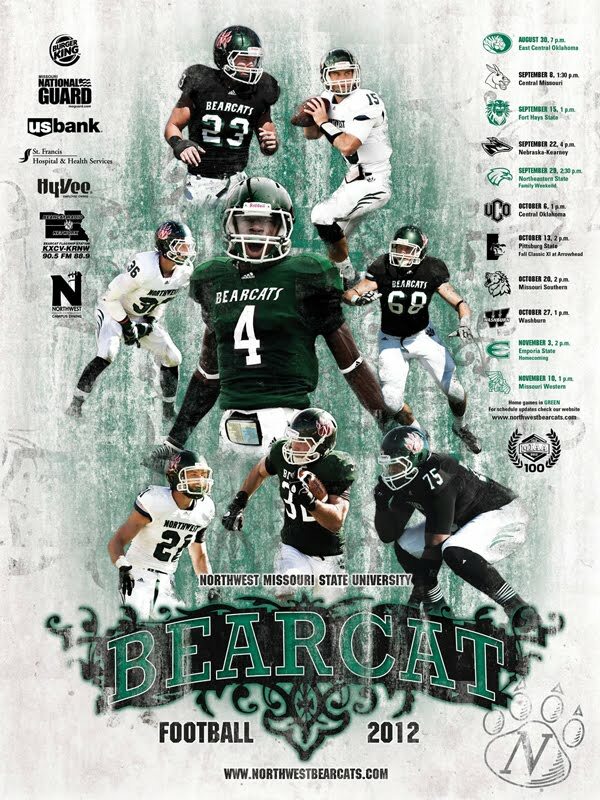 Northwest Missouri State advanced to the quarterfinals of the Division II playoffs last season and opened 2012 with 33-3 thumping of East Central (Okla.). 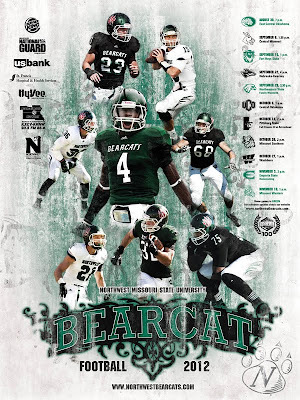 The Bearcats last won a national title in 2009, one of three national championships won by the program. Our latest Division I-AA poster comes from Samford, which is coached by 1971 Heisman Trophy winner Pat Sullivan. The Bulldogs, coming off a 6-5 season, opened camp on Sunday. Samford will finish the regular season with a trip to Lexington to play Kentucky. Click the image to enlarge. Thanks to Don. Our latest Division I-AA poster is from James Madison, which lost in the second round of last year's playoffs to eventual champion North Dakota State. The Dukes, as you might recall, pulled off one of the biggest upsets in college football history when they won at Virginia Tech, 21-16, in 2010. Bridgeforth Stadium takes center stage in this year's poster, but the field was under water less than two weeks ago after a series of strong thunderstorms rolled through Virginia's Shenandoah Valley. It has been a messy offseason for Division I-AA Montana. Robin Pflugrad, who was 18-7 in two seasons as coach, and athletic director Jim O'Day were fired in March by university president Royce Engstrom amid sexual assault allegations, including gang rapes, involving football players. In April, a Federal Department of Education harassment complaint was filed against the university and members of the team. If this wasn't ugly enough, the NCAA notified the school that it was investigating the program. Former assistant Mick Delaney, 69, had retired in February, but he was asked to come back and take the head coaching job on an interim basis. Here's the poster schedule of Division I-AA national champion North Dakota State. Not only are the Bison kings of I-AA, they are making a habit of steppng up and beating teams from Division I-A. Last year, North Dakota State won at Minnesota, 37-24. In 2010, it beat Kansas, 6-3, at Lawrence. This season's Division I-A opponent is Colorado State. Click the image to enlarge. Thanks to Justin. After the jump is a highlight video from the Bison's I-AA championship victory over Sam Houston State.